Redness and Rosacea are a Common Concern at Hermann Wellness: ZO Medical Rozatrol May Be the Answer - Doctor Hermann M.D.,P.A. Many people suffer from facial flushing, redness, broken capillaries, visible blood vessels, and rosacea. Hermann Wellness wants to help clients address these concerns with ZO Medical Rozatrol Normalizing Serum Treatment for red sensitive skin. ZO Rozatrol is a daily treatment serum for red sensitive skin with an advanced amino acid complex that helps to restore skin to a more radiant appearance. Lactose, milk protein, and brassica oleracea italica extract helps minimize the appearance of skin redness. Farnesyl acetate, farnesol, and panthenyl triacetate helps reduce excessive oil. Papain provides gentle, enzymatic exfoliation to improve skin texture and tone. ZO-RRS2™ is an exclusive plant stem cell complex that provides powerful antioxidant to help minimize inflammation and protection to help prevent the signs of premature aging. Glycerin to replenish hydration and support healthy skin barrier. 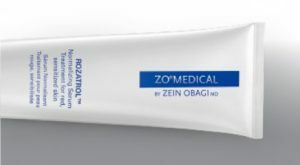 ZO Medical Rozatrol can minimize severity of rosacea, flushing, and redness. Stop in and purchase this skin changing ZO Medical physician grade product and see your skin improve in as little as 6 weeks. Or book a free consultation with one of our providers or esthetician to develop a treatment plan tailored to your specific skin care needs. Herman Wellness offices Tampa (813) 902-9559 at 3040 W. Cypress St. Tampa, FL 33609 or St. Pete (727) 278-3992 at 6387 Central Ave. St. Petersburg, FL 33710. Xeomin or Botox – Which is the Right Choice for Me? © 2019 Doctor Hermann M.D.,P.A.. All rights reserved.